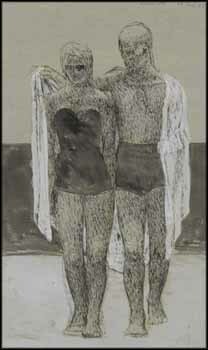 This evocative work is the study for the 1955 serigraph After Swimming, which was produced in a small edition of 27. It is one of a group of images characterized by their minimal details and settings, their subject a man and a woman. David Burnett writes, "In these works the sense of communication is brought about through a subtle and gentle stating of events, bearing on the intimate elements of a relationship. Their expressive capacity is found in the warmth and gentleness of slight gestures and in an openness and familiarity that relies on mutual trust and respect." In Study for After Swimming, the bathers are Alex Colville and his wife Rhoda, whose loving relationship embodied the values that formed the core of his life. In this fine study, Colville emphasized the volumetric solidity of the figures. His reduction of the scene to its primary elements - sky, water, sand and the couple - gives it more impact, and draws our attention to the tenderness of Colville's gesture in drawing the towel over Rhoda's shoulders. It is a rare and classic 1950s image from Colville's oeuvre.